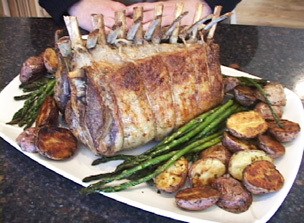 RecipeTips.com's video demonstration, 'How to Roast a Rack of Lamb,' has easy-to-follow instructions to roast a rack of lamb that will make everyone's mouth water. Hi! This is Laurie from RecipeTips.com. Today we are going to be roasting a rack of lamb. I have two racks of lamb here presented as a guard of honor. You French the rack of lamb and then crisscross the bones so that they present themselves as a soldier's sword. Start by basting the rack of lamb with either olive oil or regular vegetable oil. The next step is to season the lamb. The seasoning I am using is two teaspoons of a kosher salt, one teaspoon of garlic powder, a half of teaspoon of pepper, and a half of teaspoon of onion salt. Sprinkle it over the entire rack of lamb and then rub it in slightly. It is best to use a roasting pan that has a rack with it but if you don't have one, it will work fine as well. Place your lamb in the center of the roasting pan. Use a small piece of aluminum foil to cover the bones to prevent them from burning while roasting. Place the lamb in a 425 degree preheated oven for 15 minutes, at that temperature the outside will sear. After that we are going to drop the temperature to 325 and roast it for 15 minutes per pound. Remove the lamb and check the internal temperature. You want the temperature to be approximately 140 degrees because once it rests the temperature will rise at least 5 degrees. A 145 degrees Fahrenheit gives you a medium-rare lamb. Tent the rack of lamb with aluminum foil and allow it to rest for 15 minutes. For more information on roasting lamb, visit RecipeTips.com.